❥ - - - Pony Town: Revlon Lip Butters! My Revlon Lip Butters came in the mail today! I'm so excited for these because they were so hyped on the YouTube beauty community! I bought L-R: Peach Parfait, Red Velvet, Fig Jam, Candy Apple, Pink Truffle. I've tried each of them on my lips, and I have to say, I love the way they feel on my lips! They remind me of my Dior Addict lipstick! I'll update this with a picture of some swatches. Peach Parfait: The sheerest of all the colours I purchased. It's a lovely pink colour, but unfortunately it does not show up on my pigmented lips. However if you have pale lips and a pale complexion, this would look lovely. Pink Truffle: This is my "my lips but better"colour. It's a neutral pink with a little bit of brown undertone. Candy Apple: A bright red, slightly orange with a hint of shimmer. If you have trouble with red lipstick, give this a try! You can put on a tiny bit and spread it out and have a hint of red on your lips, or put on a few layers and have glossy bold lips! Fig Jam: This is a brown lipstick and I think it'd suit those with pigmented lips. It gives off a sort of vampy plummy brown. I really like this one! Red Velvet: This is my favourite! It comes off as a vampy red if you layer it on, but you can always just apply a little! Lunch today at Petaling Street. I'm not a huge fan of Malaysian cuisine, but I did enjoy this steamed chicken bento! I went with my sister to buy her school uniform, and the sales lady looked straight at me and asked me which school uniform I was looking for. I've always loved GIFs in blog posts I read. It always adds an element of humour to the post! I'm going to use them more often! I'm currently obsessed with Josh Hutcherson! I've been a fan of his since Bridge to Terabithia (he was so adorable!). I never realised how cute he is now! I want to use that line one day when a cute guy says he's single and I hope to dear god that he has read The Hunger Games and then we fall in love and live happily ever after. I wish I could have a Josh Hutcherson all to myself. Ooh I don't have Red Velvet or Fig Jam but I REALLY WANT RED VELVET! 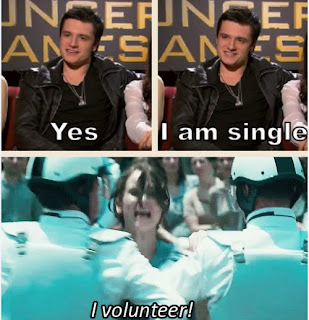 Hahaha love that last pic, though I'm not really a fan of Josh Hutcherson. His face is kinda square/smooshed looking in my opinion haha. LOL YOURE SUCH A CUTIE.